"Say it with flowers," the florists’ motto, was first used by Rugby businessman N.P. Lindberg to advertise his greenhouse on the east side of this farming town and regional business hub. True to the motto, Rugby blooms from the surrounding high plains with shady streets and dedicated residents’ gardens as if to say welcome to visitors, many on Amtrak’s Empire Builder run from Chicago to the sea. Rugby’s first train arrival was in August 1885, one month after the town was platted. 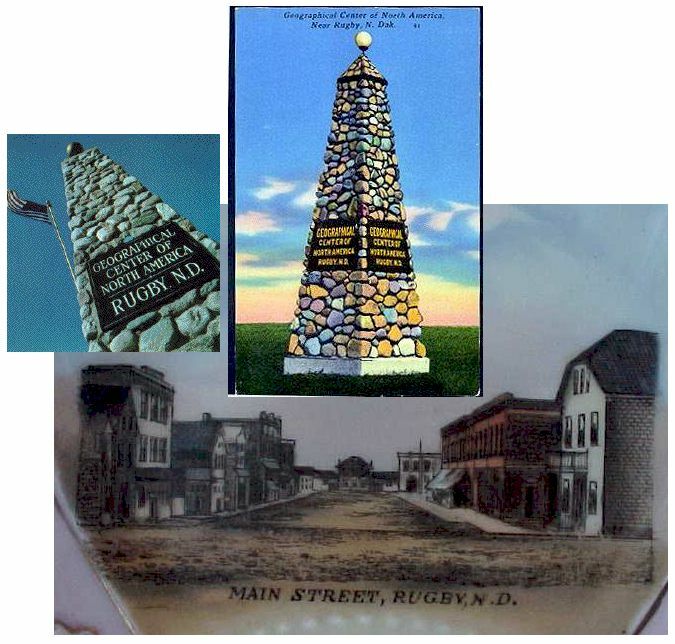 Though the town was named by railroad executives for Rugby, England, in hope of tempting English settlers, Scandinavian surnames tended to be the norm, as in nearby York, Norwich, and the Icelandic settlement of Leeds. Rugby is probably known less for winter wheat and dairy products than for being the Geographic Center of North America, but agriculture is the cause of celebration during Fourth of July weekend at the Pierce County Fair and State Horse Show. Throughout the summer, concerts draw crowds at the Ellery Park gazebo. As for the Geographic Center, the present marker-actually several miles from the true center-will soon be illuminated by an Aurora Borealis simulation projected by a 110-foot tower near the intersection of Highway 2 and Route 3. North Dakota’s first permanent settlers arrived in 1812 from the Earl of Selkirk’s colony in neighboring Manitoba. As farmers, they were a forward-looking breed: by the 1870s, they were using sophisticated methods and mechanized equipment their counterparts in the eastern United States had barely heard of. Many of these implements, including an early McCormick Deering threshing machine, have found their way to the restored Pioneer Village at Rugby. 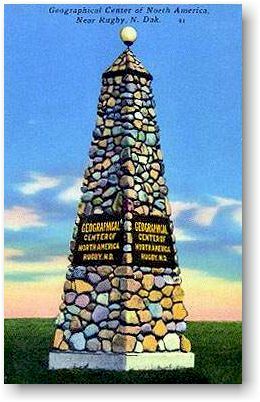 In Rugby, North Dakota, a fieldstone cairn marks the geographic center of the North American continent. For most of the year Rugby is a quiet farm community, but during the third week of June, the State Championship Horse Show fills the town with horses, riders, and admirers of equine prowess. Keith Robertory, who did the research for this, notes, that the town has two bars; "Overtime Bar" and "Shadow 1 Bat."